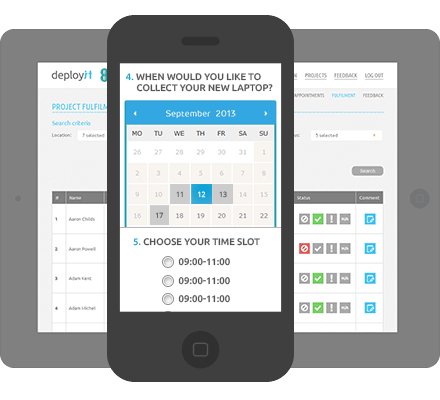 Deployit is an email and appointment management platform designed specifically for IT rollouts. Users are able to choose and re-arrange their appointment as many times as they like, up until lockdown. The rollout team determines the lockdown date, has full visibility and ultimate control. Instantly know the status of each individual and have access to a complete transactional history for each migration. 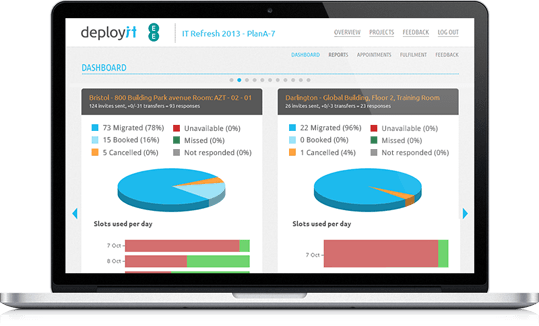 The deployit dashboard provides gives you a complete graphical overview of the rollout making it easy for you to manage all your locations, users and slots in one place. At a glance see which locations and time slots are proving to be the most popular. Everything in one place. Admin features make it easy to control appointments and user details. Automated reminders and nudges keep appointments fresh in the user’s mind. Always be prepared for progress meetings throughout the rollout with live reports available to export, email or share. After migration all users are invited to share feedback on their rollout experience. Users are given flexibility to choose a date, location and time slot that suits them best. They can change their mind as much as they like – until lock down. Deployit enables project managers from different countries to collaborate and share. Know exactly how the rollout is going anywhere in the world at any time. Make users feel extra special. 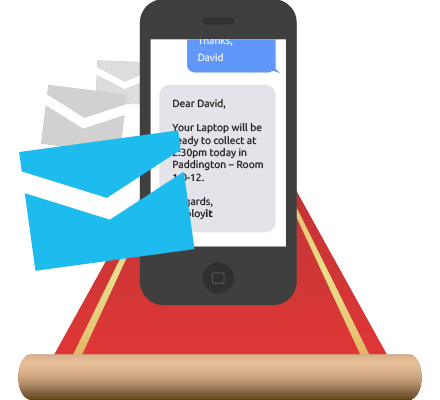 Deployit delivers detailed personal communications and provides a booking system that works around them. Instant feedback means you learn and improve mid-project. ©2019 deployit. All Rights Reserved. Terms / Privacy. Deployit is a division of Extravision. Company Registration No. 05017214 (England & Wales). 107 Timber Wharf, 33 Worsley Street, Manchester, M15 4LD.